Ripon is a cathedral ceety, mercat toun an successor pairish in the Borough o Harrogate, North Yorkshire, Ingland. 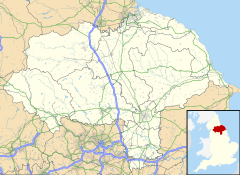 ↑ "2011 Census: Key Statistics: Parish Headcounts: Area: Ripon CP (Parish)". Neighbourhood Statistics. Office for National Statistics. Retrieved 27 October 2013. ↑ "British Towns Twinned with French Towns:". France. Archant Life. 2006. Retrieved 7 March 2012. This page wis last eeditit on 19 Juin 2017, at 23:11.